Body – he wants to wrap one arm around my waist with the free hand in his pocket. He always stands on the left side in the picture like you see in the “Groom” attachment. Please draw us close together with little or no gap in between our bodies. Headshot- I’m the person in the center in the “Bride” picture. Please add a pendant to the caricature. Bouquet- same as the picture but I wanted more calla lilies than red roses. I just want enough roses to match the groom’s attire. Hairstyle- the “Hairstyle” picture is exactly how I want my hair done (with tiara and everything) Please add a veil behind me if you find it prettier or better. I leave this to your judgment. I have included a background of Minneapolis. I want it exactly like the picture where it’s around sunset and the city is lit. You can place us wherever you see fit. Because my fiancé and I are born the year of the rat, we’d like to have two cute mice somewhere with a piece of cheese in a shape of a heart (some ideas are two mice snuggling next to each other holding the cheese or one mouse give the other mouse a heart shaped cheese, but again, I leave this to your expertise. Whatever that makes it cute looking). I like the way my bangs fall on my face but my hair is longer than when that photo was taken. Look at “Bride” to get an idea of how long my hair is. Can you do my hair with those bangs and longer hair length? I would like a tiara also in my hair and dangly earrings added. The design of the tiara and earrings are to your discretion; whatever makes the picture look good and flows. 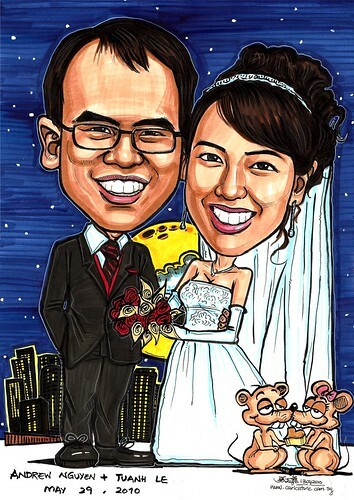 Can you also include our wedding date (May 29, 2010) and names (Andrew Nguyen & TuAnh Le) underneath our caricature? Thanks"
They requested to change the sunset sky to starry nighte, after seeing another wedding caricatures done by me on posted Facebook.